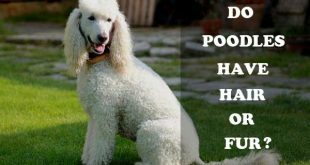 Do Poodles shed a lot? The above question is a very common one. That is why we are going to answer it and even more – we will provide you the full information about the shedding of the Poodles. When dogs’ hair is already old or damaged for whatever reason, they naturally lose it and it happens by shedding – a normal process, while the amount of hair and frequency depend on the dogs’ breed and their health. Another variable is the season – in the winter the dog’s coat is thicker and, in the spring, he sheds. If your dog lives indoors, the coat thickness will shed evenly during the year. “Poodle don’t shed” someone might say and the sentence can be looked in different point of views. First, a lot of breeds have plush double coat. Despite this, the Poodle doesn’t. Their coat is single and dense and the hair is curled. The hair, grows and fall out of the coat, often – into the coat. So, yes, they do not shed, at least not in the traditional canine way..
And since all dogs shed, why would not the Poodles? Well, they have not fur but hair like humans and that’s why Poodles are brought to hairstylists and are treated with special hair products. You can check our article about different Poodle haircuts. Still, the Poodles do change their hair but not as intensively as the dogs with fur. The difference between the normal fur and the Poodle’s hair is in the hair thickness, in the hair growth and in each hair’s texture, as well. Poodles are with a more similar hair to that of a human than other dogs – which are with a thicker fur. The coat of most of the dog breeds has, shorter growth cycle than the poodle’s coat. This is determined by their genes. And the Poodles, and other dogs with coat like theirs, have longer hair growth cycle, which means that they shed less. There are few breeds that are being frequently mentioned as good for people with allergies, and the poodle is one of them – their coat not only have long growth period but also are lacking in undercoat and the coat itself is tightly curled. Thanks to these facts, the dead hair cannot detach and float in the air and also this retains the dander – which is a common allergens’ source. It also means that you should remove the dead hair by removing it manually when you groom and brush your dog regularly, otherwise it will not fall from the coat but will tangle in and will cause matting, which will be the cause of more serious skin conditions. Yes, the Poodle does shed! No matter if we talk about Standard, Toy or Miniature poodle shedding! the shedding is less noticeable, though, than in other dogs. It happens during the whole year. Other breeds might have periods of rapid shedding – then you will find hair everywhere, on the carpet, on the bed, et cetera. Another thing about the Poodle’s coat is that it is constantly renewing so their coat color will change as they grow up to become adults. Because of the lack of periods of heavy shedding and the fact that the coat is long and thin, the hairs fall on the Poodle’s body and you will not find a lot of hairs at your house. But you will find the old, dead hairs while brushing/combing or bathing your Poodle. Grooming is a must – one very important factor for the hair. You should take care of your Poodle’s coat so the hairs won’t fall out on the floor. The less you care for the hair of your dog, the more it will fall out – so you need to regularly trim it, nourish it, calm brush it and wash it properly. In order to prevent the matting and removing the knots, you should brush the coat, removing the old fallen hairs. What is considered normal Poodle shedding? Not everyone thinks that finding hairs on the brush is a normal thing. If you are one of the before-mentioned, you should know that it is not a problem at all. this is a normal process and is recommended for this cleans the coat and improves its health. If you find hairs on the brush, then you are doing it right! When your Poodle is pregnant, you should expect hair loss. It is common thing for the hair to change its thickness and this is a normal process, which means that the normal and standard hair will return eventually. You will only have to wait, since you cannot do anything to change this and if your dog is healthy, there is nothing to worry about. Heat cycle might affect female Poodle coat too. It might become thinner and the dog can start losing heir, when whelping a litter or while being in heat. Hormonal changes can also affect a lot of female Poodles – for example, when in a heat cycle, after having given birth and during she is whelping her litter – when estrogen surge occurs. In females the hair loss might be so heavy and the coat so thin that the skin can be exposed in random body areas. If this process takes place, then up to 4 months might be necessary for your dog’s hair to grow back and be normal again. Sometimes, if your dog is shedding too rapidly, then you can apply a leave-in conditioner. The shedding might have been due to climate changes – during times of climate changes rapid hair loss might occur and then the hair becomes damaged. What you need to do during such periods is to repair and recover the hair. Do remember that if you apply some of your human products for hair, that does not mean that the dog’s coat will be saved. 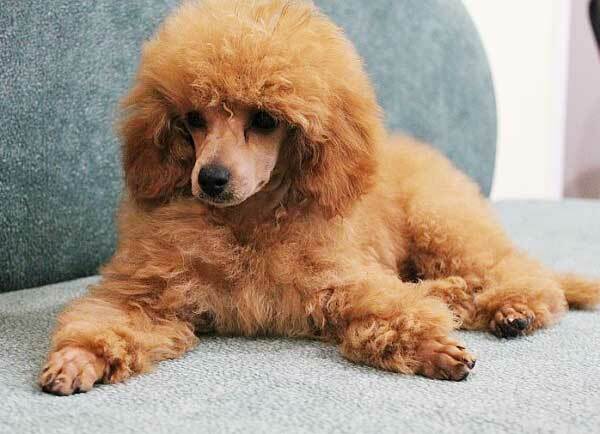 Quite contrary, many products used on human might damage the Poodle’s hair even more, causing increased hair loss. You should use only products that are certified and tested for dogs. This way you will ensure a proper treatment for your dog, without making the situation even worse. not every time shedding is normal.. Sometimes you should be worried about your dog. Sometimes the shedding might be because of some illness and you should be concerned. If you are not sure if the shedding is normal or not you should go to the vet! If you apply human hair products to your dog’s coat, this can be a reason for an allergic reaction, but this can happen even if you use ordinary products for dogs. If your Poodle is allergic to dog shampoo, dog food additives or other dog products can be a reason for intense itching. When the dog is itching and scratches himself, this can become so severe of a problem that the hair starts falling rapidly and scabs can form. Another reason for allergies are flea bites – this can cause hair loss for your dog as well. Women can suffer from hair loss because of hormonal problems and so do Poodles. Yes, this is exactly what happens during pregnancy but there are other such cases, too. Sometimes your dog might suffer from hormonal disbalance, as well as people do. One very important reason to take your Poodle to the vet is because he/she can have parasites. A lot of parasites exist and most of them are very tiny and you won’t be able to see them. If you delay eliminating the parasites the situation can worsen and your dog will suffer not only from hair loss but from other health problems, too. Losing a lot of hairs might be because of different diseases. In order to determine the correct, diagnose, you should contact a veterinarian, who will be able to prescribe the right medication. This disease is an inherited one. The condition can cause thinning to the coat (it can even completely fall off). It is important to know that there is no such thing as a 100% hypoallergenic dog! Every breed might trigger an allergic reaction in people. Yes, when Poodles shed they don’t do it like the most of the dogs. Yet, this does not remove this danger for people with allergies. The Poodle’s coat has dander to which some people may be allergic. While this is a very rare allergy, we mention it to show you that there is not a dog that is a 100% hypoallergenic. Previous Do Poodles Have Hair or Fur? Next Phantom Poodles: What is a Phantom Poodle?